The Feiyu Vimble c, in black, is a 3-axis gimbal stabilizer for smartphones and -- via optional EVA foam pads -- action cameras. It allows you to capture smooth video when you're in motion, like when following a subject up the street or up the stairs, or when speaking into the camera while walking. It also offers sophisticated functions such as Face Tracking, which quickly locks in on a face and automatically follows it when the person moves around. The Vimble c supports virtually every smartphone (up to 3.1" wide), including the iPhone 7 Plus. The phone adapter securely clamps the phone without any tools or screws required, and the adapter is adjustable from side to side to let you find the ideal balance. Using two foam pads, sold separately, the adapter can be transformed to support an action camera. Simply attach the pads to the lips of the adapter and squeeze the camera in between the pads. Any action camera with a shape and size similar to the GoPro HERO5 Black will fit. The gimbal features precision brushless motors and Feiyu's G-series algorithm that together constantly find the balance your phone/camera needs as you move around. The three axes — pan, tilt, and roll — each rotate up to 320°, providing you with near full-circle travel in all directions. 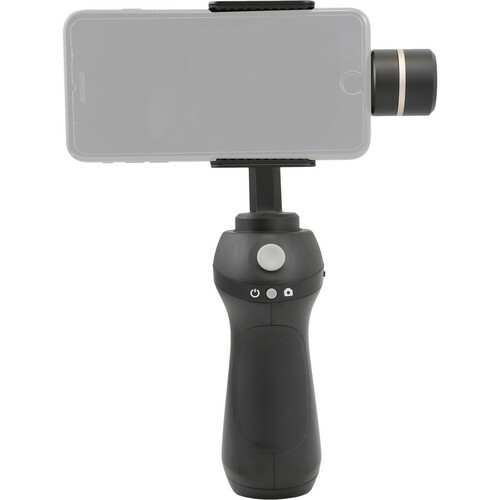 A flat joystick on the front allows you to adjust the three axes, and a thumbwheel on the rear that's accessible with your index finger lets you switch the camera adapter between landscape and portrait modes. The gimbal also comes with the Feiyu ON app for iOS and Android (free download), which it connects to over built-in Bluetooth. The app is a major component of the Vimble c, as it provides additional functionality. When you use the gimbal with the app, the power button under the joystick also works as a shutter release. A short press takes a photo, and a long press begins video recording. Similarly, the thumbwheel on the back can be used to adjust focus, exposure, and other parameters via the app. The app is also where the Face Tracking function and other functions are accessible. The other functions include Dynamic Time-Lapse, Smart Portrait Mode, and Dynamic Panorama, which lets you take seamless, super-wide panoramic images. The Vimble c has a built-in battery that runs for approximately 5 hours. A USB charging port is positioned on the side of the gimbal, and a USB charging cable is included. The gimbal also has a 1/4"-20 screw-hole on the bottom for mounting on tripods, monopods, and other support gear. The Face Tracking feature can be used very successfully when the gimbal is mounted on a tripod. Although compact, the Vimble c is not as small as it may look. It's designed to be very comfortable and effective to handle. Moreover, the widened base of the gimbal allows you to steadily place it on a table in front of you instead of having to lay it down. Box Dimensions (LxWxH) 12.0 x 6.1 x 2.9"
Vimble c Gimbal for Smartphones & Action Cameras (Black) is rated 3.0 out of 5 by 1. Rated 3 out of 5 by Vargas365 from Could be better It stabilizes just fine and the app has some nice features. I wish it was able to connect to social media apps, especially its following feature, but alas. I can't seem to find anything about it. The grip is a nice touch.